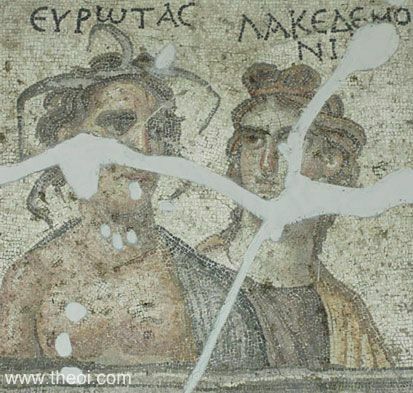 This mosaic portrait depicts the Spartan river-god Eurotas and his wife Lacedaemonia. The god wears a grey-blue robe and is crowned with a wreath of reeds. Lacedaemonia, the eponymous goddess of the land of the Spartans, wears an earthen-red robe and a cloak of gold--probably symbolising the earth and fields of ripened grain.